Testimony at an NAHC hearing in San Diego revealed that some ancient remains were actually removed from the site and stored at a distant location, while others remain at the wind project site. Forensic dogs brought in by Native Americans and trained to find ancient remains alerted at over 50 locations at the wind project, yet construction was allowed to proceed. The NAHC ruled in Viejas' favor and declared the site a sanctified Native American cemetery. 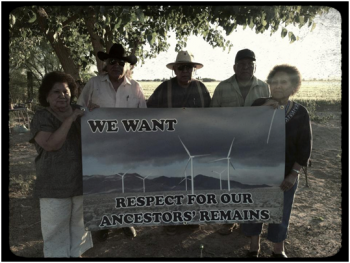 Further, the NAHC asked California’s Attorney General to allow the NAHC to pursue legal action against the federal government for approving the energy project on Bureau of Land Management public land where tribal burial sites, artifacts and other cultural resources were supposed to be protected. However Attorney General Harris informed that NAHC that it does not have jurisdiction to sue a federal agency over a project on federal lands. Harris further advised the NAHC that her office would no longer represent the NAHC on the Ocotillo matter due to a conflict of interest, according to a letter sent by the NAHC to Viejas Chairman Anthony Pico. The nature of that conflict was not disclosed. the project is a noghtmare. the project is a nightmare. huge chunks of desert scared for hundreds of years. the vegitation restoration is a joke. Indian artifacts on sacred land? These would've brought any other developer to a screeching halt. But not the government.